Two New POD Cameras Installed on Sheridan Road Reviewed by Edgeville Buzz on June 6, 2009 . 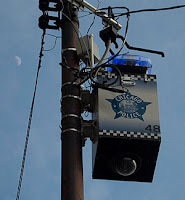 Mary Ann Smith notified residents in an email that she has installed two new police cameras based on feedback/requests from the residents in the ward. She used her discretionary funds to purchase the cameras, which are located at Sheridan & Lawrence and Winthrop & Sheridan. These cameras are a new design which reduces the size and intensity of the flashing blue strobe lights, which make them less intrusive. UPDATE: Dear Bobbytuba – thanks for the feedback…but you need to get out and explore the ‘hood. Sheridan and Winthrop actually do cross – see the map below. You can leave your aplogy in the “comments” section. Thanks.